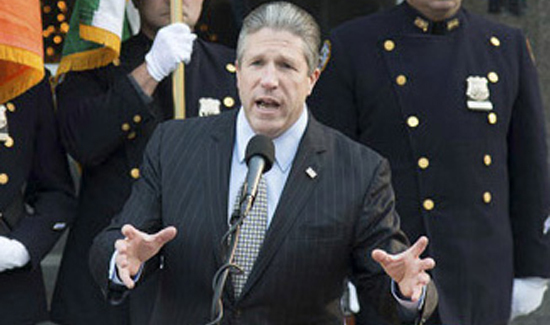 Pat Lynch, president of the PBA of New York City, has landed a deal for his members—24,000 NYC patrol officers. The tentative contract agreement recently reached between the New York City Patrolmen’s Benevolent Association (NYCPBA) and the City of New York represents a significant shift in that municipality’s approach to compensating the police officers on the nation’s largest force. After several years of bargaining and vocal advocacy by the NYCPBA, New York City has at last recognized a basic truth about the job that police officers do – a different job, one filled with growing risk and ever-increasing challenges and demands. For the first time ever, the city has proposed a permanent pay differential that addresses the added responsibilities and increased scrutiny its officers face. A “Neighborhood Policing Differential” of 2.25% of base salary (on top of a package of general wage increases with no zeroes) will apply to every single NYCPBA member in perpetuity. It’s not a one-time bonus or a perk for only certain members of the bargaining unit but a recognition that all New York City police officers’ duties are constantly changing and growing. Besides acknowledging the unique nature of the job, the city also finally agreed to correct its long-standing failure to protect members injured in the line of duty. An agreement between the NYCPBA and the city to jointly pursue pension enhancement legislation will restore certain disability benefits for recently hired police officers left unprotected by a 2009 veto of a pension extender bill by New York’s then-Governor David Paterson. Once enacted, the legislation will put an end to the unjust situation in which police officers disabled on the job would have received a pension benefit of as little as $34 a day. Many other positive components are included in the deal—including more vacation days for recently-hired members, a lump sum terminal leave cash-out, and significant new contributions to the union’s Health & Welfare Funds—but the most important feature is that it continues to pave the way towards the union’s ultimate bargaining goal, to restore New York City police officers—who protect a city that is, along with perhaps Washington, the country’s prime terrorist target—to their rightful place among the highest paid police officers in the nation. That fight is far from over, but the terms of this contract will open new paths towards reaching that goal, without closing off any existing ones.